This chapter presents an overview of the different parts most commonly found on the three main types of guitar. The body of a guitar consists of a treble or upper bout (the half of the guitar closest to the neck), the bass or lower bout (the wider half of the guitar), and the waist bout (the narrow section between the treble and bass bouts). The body is one of the most important factors in shaping the overall tone of a guitar. It provides the resonance that shapes the tonal qualities. It determines the volume of acoustic guitars and affects the sustain of electric guitars. The woods listed below are used in the construction of both acoustic and electric guitars. Agathis (also known as Commercial Grade Mahogany or Poor Man's Mahogany) is a tropical pine commonly found throughout south-east Asia. It is a plantation-wood used mainly for building cabinets. Agathis is cheap and usually used in the construction of budget guitars. Its tone is similar to mahogany but more bland sounding with a less complex response. Alder is a lightweight wood that provides a clean balanced tonal response and good resonance. Its soft and tight porous structure is similar to basswood but with a bolder hard grain pattern that adds to the stiffness making it more robust. Alder has a medium light tan color and provides a balanced tone across the frequency range with a slight upper mid-range producing a clean sound. Its resonance provides a good dynamic range. (1) Northern hard ash (also known as Baseball Bat Ash) is hard, heavy and dense. This gives it a bright tone and long sustain. (2) Swamp Ash (also known as Southern Soft Ash) comes from swamps in the Southern USA. Swamp Ash grows underwater which makes the wood lightweight and porous. Many Fender guitars from the 1950s were built with Swamp Ash. It has hard grain lines between its softer layers and a creamy light tan color with bold darker grain patterns. Its tonal qualities are a balance between brightness, warmth and dynamic range with clear bell-like highs, slightly scooped mids and strong lows. Swamp Ash has good resonance across the whole frequency spectrum and therefore can sound quite complex. Basswood is a lightweight (lighter than Alder) close-grained wood with a consistent and tight grain pattern. Its very soft with light colors that range from almost white to medium tan. It requires a hard finish, such as polyester, for protection and good engineering to allow the screws and screw-holes to hold the parts. The installation of a tremolo system on such a softwood also means the body needs to be thicker to prevent cracking. Tonally, basswood has a warm soft tone which attenuates both the high and extreme low frequencies. It also creates a pronounced midrange fundamental frequency response and a reduced smoother high-end response. The tonal response compared with other softwoods such as ash and alder is less complex with a narrower dynamic range. Basswood doesn't excel in clean sounds though when coupled with distortion and overdriven amplifier produces a metal-lead sound much favoured by some rock guitarists. It is used in the construction of budget guitars and expensive guitars. Cedar became popular in the mid-twentieth century after master luthier Jose Ramirez III of Madrid pioneered the use of red cedar as a substitute for the increasingly scarce European spruce. It is now considered one of the world's premier tone woods. Mahogany is a highly dense, heavy wood with a fine, open grain and large pores. The color is reddish brown. Tonally, it provides good low frequencies, a compressed mid-range and smooth sounding highs. Overall, its tone is mellow, soft and warm with a full and thick quality. Its density provides excellent sustain and also makes it less susceptible to dents and scratches. Its density and weight have led some manufacturers to experiment with a thinner body as seen on the Ibanez S series. Nato (also known as Eastern Mahogany) is a native wood from the Caribbean and South America. Nato is not a mahogany though its appearance and tonal similarities to mahogany has led to it being used on guitars as a mahogany substitute. It is also a commercial grade wood used in cabinet building. It has a bright tone with pronounced midrange but lacks in sensitivity and punch compared with mahogany. Nato is used by the manufacturer B.C. Rich for their Assassin range. (1) Eastern Hard Maple (also known as Hard Rock Maple or Sugar Maple and usually associated with maple syrup) is an excellent tonewood. As named, it is very hard and dense with a medium weight which makes it difficult to work and therefore it is usually reserved for necks. When used for the body, it provides a bright sound with very strong highs and upper mid-range but quieter bass frequencies. Overall, hard maple has a very long sustain. Eastern hard maple can exhibit a figure (grain pattern) called the bird's eye whose aesthetic appeal has led to it being used for guitar tops and backs usually bookmatched. (2) Western Soft Maple (also known as Big Leaf Maple) is much lighter in weight than Hard Maple. It has a bright tone with good bite and attack though not as brittle as hard maple. Its tonal qualities produce singing highs with a tight low-end. This kind of maple is often seen with a figure called flame or curl and less commonly a figure called quilt. Rosewood is used for the backs and sides of acoustics and also for fingerboards. It possesses an extremely high density which makes for an acoustically reflective tone wood. Its color is dark brown with reddish, purple or orange streaks running through it. There are many varieties of rosewood that are suitable for guitar construction. Poplar is a wood used by manufacturers of budget guitars most notably Danelectro who use masonite (top and back) glued to a poplar frame (sides). Its a closed grain wood with a greyish-green color and similar to alder in weight and tone. Due to the resurgence of interest in budget guitars from the 1950s onwards some modern reissues that use poplar are relatively expensive. European Spruce is a premium tonewood used in the design of many stringed instruments including the violin, viola and lute. Increasing scarcity has resulted in the use of substitutes such as the North American species of spruce and red cedar. Walnut is a medium hard wood with a strong grain pattern. Its body has a constant density. Walnut is harder, heavier and more dense than mahogany and therefore closer to maple. Tonally, it is warmer than maple with a solid low-end. The mid-range is relatively complex and the high-end is smooth and bright. Due to its density it provides good sustain. Some electric guitars have an extra top added to the body to blend the tonal qualities of different types of wood together. Maple with figuring is a popular top and produces a pronounced look and tone (adds brightness). Body tops are not used on acoustics since the layering of two pieces of wood for the table would inhibit the resonance and dull the tone. The bridge is found on the lower bout of the body and its function is to allow the strings to sit at a relative height to the fretboard. Depending on the guitar, the strings may terminate at the bridge or just pass over it. On electric guitars the bridge can be raised or lowered using two screws (thumbscrews which can be rotated with the fingers or traditional screws requiring a screwdriver) at either end of the bridge. This is discussed further in the Adjusting the Guitar section. The bridge of an acoustic consists of two parts: a saddle and the tie block. Saddles are either a piece of plastic or polished bone and like the electric guitar bridge keep the strings at a relative height to the fretboard. Saddles are made with a smooth top edge (no notches) and the base of the saddle is seated in a groove cut into the tie block. The wood tie block of a classical guitar is glued to the lower bout and acts as a string terminator. A classical guitar string is pushed through the hole in the tie block and the string is then brought back under itself three or four times and pulled tight to form a knot. Once the saddle is seated in the groove of the tie block the tension of the strings clamp it. Steel string acoustics also have a saddle and tie block though due to the strings having terminating end balls there is no need to knot. The saddle and tie block on acoustics are not adjustable and are set to the correct height by the manufacturer. Adjustments to the height of the acoustic saddle are possible by shaving (lowering) the saddle though this job is best left to a luthier since any changes will be permanent. The design of bridges varies greatly between different manufacturers and the above generic descriptions may not apply to some guitars. Regardless of the design the main purpose of all bridges is to maintain the strings at a relative height to the fretboard. The fretboard is a piece of wood that is glued to the front of the neck. These are commonly made of rosewood though other hard woods such as ebony may also be used. Embedded in the fretboard are a number of metal frets (fret-wire) usually numbering twenty to twenty-four. Strings are pressed down behind a fret which changes the length that is left free to vibrate thereby producing a different note. A simple demonstration is to be found on the twelfth fret. On all guitars this is the fret that divides the string exactly in half and produces a note an octave higher than the open note. Any open string that maintains its original tension and is halved produces its octave. This applies to all stringed instruments including the piano and violin. The first fret is the one nearest the nut. Some manufacturers place a zero fret immediately after the nut and the strings sit on the zero fret. This brings the sound of the open strings nearer to the quality of a fretted note. A fretboard may have decorative inlays at the 3rd, 5th, 7th, 9th and 12th frets which serve as markers for the positions of the guitar. Fretboard inlays can be highly decorative or simple shapes and on expensive guitars may be made from exotic material like mother of pearl or abalone. The headstock lies at the end of the guitar's neck. The purpose of the headstock is to support the tuners, which terminates the strings of the instrument. The tuners are attached to tuning pegs and this allows the guitarist to lower or raise the pitch of the string. A secondary purpose of the headstock is identification and many guitar manufacturers choose to use a distinctive headstock shape often in combination with the name of the model and a trademark logo. On some guitars the model name and trademark logo may be created using inlaid materials though decals are also commonly used. The neck can be a single piece of wood or several pieces glued together and cut to shape. The fretboard is a separate piece of wood that is attached to the neck. Necks can be glued to the body (set neck) or bolted on. Set necks are usually found on acoustic guitars and many other instruments including the violin, lute and cello. The bolt-on neck is a design feature more commonly associated with electric guitars. Most necks are wood though alternative materials such as carbon fibre composites have been used. All strings pass through a nut at the headstock end of the fretboard. Its function is to maintain correct string spacing and alignment so that the strings feed into their respective tuning pegs. On acoustic guitars the nut and saddle are usually made of the same material. Electric guitars commonly use plastic or synthetic nuts though sometimes metal is used. As tremolo bars can cause tuning problems, guitars equipped with them usually have some manner of locking nut, where the strings are clamped down. Tip: Some guitarists lubricate the nut grooves so that the strings move more smoothly. You can do this at home with a soft graphite pencil. There's no need for excessive marking with the pencil just a few swipes through the groove should deposit enough graphite. Guitars, in common with all wood instruments, are prone to dents, scratches and wear. A pick guard (also known as a scratch plate) protects the body of the guitar at the point of most contact. Some electric guitars have raised pick guards so your pick is directed out and away from the pots and strings. Pick guards sometimes need replacing due to wear or damage. In the case of an expensive or rare guitar, which may have a tortoise shell pick guard, the guitar will have to be sent to an experienced luthier. Sound holes are found on all acoustics. Their purpose is to allow the air pressure to stay equalized so that the soundboard can vibrate. Archtop guitars have f-shaped sound holes - a design feature they share with the violin, viola, cello and double bass. Round sound holes usually have a decorated edge based on a geometrical design known as a rosette. On modern guitars these decorations are machine-made though some luthiers of expensive guitars still use the traditional method of laying by hand small pieces of exotic material like mother of pearl.
. Excessive adjustments to the truss rod should be avoided as this can render a guitar unplayable. Tuning pegs are used to raise and lower the pitch of the strings. 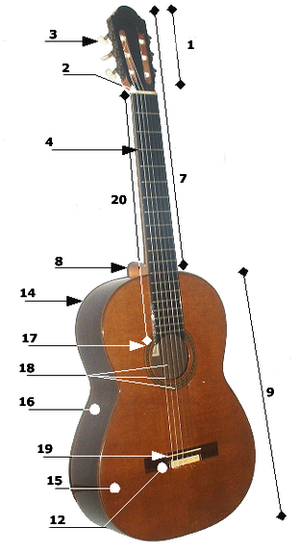 Acoustic guitars have two rows of three pegs which, when the guitar is held as normal, presents one row at the top of the headstock and one row at the bottom. Electric guitars may have tuning pegs in a single row running along the top of the headstock (Fender Stratocaster) or use the acoustic guitar arrangement (Gibson Les Paul). The tuning pegs act as string terminators and it is essential for tuning stability that they suffer no defects. Tuning pegs that are misaligned, have play or excessive resistance to turning may need repair or replacing. Tuning pegs can be mounted to a plate, three on a single plate for acoustics, or attached to the headstock as individual pegs. Both designs rely on small screws to fix the pegs or plate to the headstock. Due to the tension of the strings and the constant turning of the pegs these screws may loosen. It is recommended that you check that they are screwed in tightly though avoid over-tightening which may itself cause alignment problems or damage the screw head. Three magnetic pickups on an electric guitar. From left to right they are a humbucker and two single coils. A pickup is a magnet wrapped in a coil of copper wire. When a string is plucked the vibrations of the string causes magnetic flux which is then amplified and played through a speaker. There are several types of pickups: passive single coils, active single coils, passive humbuckers, and active humbuckers. Passive single coils are the standard pickup for Fender Stratocasters. They have a bright and twangy clean sound but traditionally have less output which results in a thinner sound. Due to their design they pick up the background hum caused by the induction of the AC current. Some single coils, such as the P-90, are larger than regular single coils, and thus warmer than a standard single coil. However they still retain more of a single coil sound and still can pick-up background hum. Another single coil design is the Lipstick, commonly found on Danelectro Guitars, where the entire pickup is placed in a metal enclosure with a small gap left between the two metal halves. Lipstick pickups tend to be bright sounding and the magnetic field caused by the gap in the metal case results in some reduction of hum. Active single-coils use battery or phantom power for enhanced sensitivity and longer sustain. Humbuckers use two magnetic coils operating in opposite magnetic polarity to cancel out the hum associated with single coils. They provide a warm and fat sound that is associated with rock and blues. Humbuckers are responsive to overdriven gain which creates a heavy saturated distortion. Some humbuckers allow coil tap (using only one of the coils) or parallel connection which provides a sound similar to a single coil. Passive humbuckers offer a rich and thick distortion with a natural decay. Active humbuckers, like active single-coils, use battery or phantom power. All pickups are capable of producing a tonal palette suitable for any genre. When choosing a guitar and amplifier the overall sound and whether it fulfills your requirements should be the main consideration. There are many different arrangements for pickups. The most basic is a single pickup near the bridge. S + S - the original Telecaster design uses two single coils. Telecasters have a percussive twang with lots of treble. Even when using thick single coils, as found on the Fender Jazzmaster and Gibson Les Paul P90, the tone is more emphasized on the treble side. S + S + S - three single coils are standard on Fender Stratocasters and Stratocaster copies. H + S + S - used on Stratocasters which are often called Fat Strats to distinguish them from the standard three single coil Stratocaster. The pick-up at the bridge is replaced by a humbucker. A favourite with guitarists who want the clean tone of single coils and the hum-free fat tone of a humbucker. H + H - the standard configuration for the Gibson Les Paul. Also known as the Double Fat Strat configuration when mounted on a Stratocaster body. H + S + H - found on the Steve Vai signature model by Ibanez and a favourite pickup arrangement for metal guitarists. Stratocasters using this configuration are called Super Strats. Every electric guitar, except those with a single pickup, has a pickup selector. Guitars with two pickups have a three-way switch which allows the guitarist to select either the neck pickup or the bridge pickup. When the switch is in the middle position both pickups are used. A tremolo bar alters the pitch of the strings. Pushing down on the bar lowers the pitch of the strings and pulling up raises the pitch. Rapidly pushing and releasing will produce a modulation in pitch called vibrato. Vibrato is often confused with tremolo, a volume modulation effect found on amplifiers, hence the misnomer tremolo bar. Originally used just for vibrato; the modern improvements in guitar design, amplifiers and effects has allowed guitarists to create a new palette of tremolo bar sound effects like the popular dive bomb. The Fender Stratocaster shown here has multiple pickups, a whammy bar and volume and tone controls. Bigsby tremolo - fitted at the bottom end of the body and with a limited pitch bend on both up and down. These distinctive looking tremolos are normally found on archtop guitars. Because of its limited range, it holds its tuning and is more stable than other non-locking tremolos that allow wider pitch bends. Vintage synchronized tremolo - (sometimes called the strat-type tremolo) can only down bend. This type of tremolo is more stable than the floating bridge tremolo though still prone to tuning problems. Floating bridge tremolo - this design allows wide bends of a tone or more in either direction though this greatly affects tuning stability. Poorly designed floating bridges on cheap guitars should be avoided since the flexibility of the design demands the highest quality in construction and components to ensure tuning stability. Floyd Rose locking tremolo - this design locks the strings therefore ensuring that the original tension of the strings are not affected by the tremolo bar and the strings return to their original tension after use. The locking tremolo makes changing strings and tuning slightly more complicated though once in tune the locking tremolo maintains tuning stability far better than non-locking designs. You still need to check your tuning every time you play since tuning is affected by other factors, such as moving from a cold room to a hot room, and the locking tremolo does not negate these factors. Almost all electric guitars have at least two pots (potentiometer) which respectively control the volume and tone. Guitars that have four pots, two for volume and two for tone, assign each volume and tone pair to individual pickups. A Fender Stratocaster will typically have one master volume pot and two tone pots for the neck pickup and middle pickup. Bolt-on neck - the neck is attached to the body with bolts which are held by a mounting plate for increased stability. The mounting plate can make accessing the higher frets difficult so some manufacturers, notably Ibanez, use a hidden plate. The bolt-on neck is a standard design used by Fender. Thru-body neck - the neck extends the entire length of the body. The strings, fretboard, pickups and bridge are all mounted on the thru-body neck. The ears or wings (the bouts) are attached or glued to the central stick. The wings may be book-matched in order to give a symmetrical appearance. The thru-body neck is usually found on high-end guitars since the design is not favoured by mass-production manufacturers. It is more common on basses than guitars. The thru-body neck allows easier access to the higher frets because there is no heel and is considered by some guitarists to offer greater sustain.